Reginald Danby was the brother of Sidney Herbert Danby, listed on these pages. While Sidney lived in Collingham (in 1911) with their widowed father, John, we are not certain that Reginald lived in Collingham. "Syd" Danby, elder son of Mr. J. Danby, of Harewood Road, East Keswick, has risen rapidly in the 11th West Yorkshire Regiment, and now holds the position of Quarter-Master Sergeant. He is now in France. His younger brother, Pte. Reginald Danby, of the 1st Lancashire Fusiliers, is now on active service again in the Dardanelles. He took part in the first landing on the Gallipoli Peninsula, losing seven of his most intimate pals, and some time later was wounded in the elbow while helping to take some Turkish trenches. After five weeks in hospital in Egypt he has returned to the fighting line. Reginald's early life contains a few mysteries. He was born on the 27th April 1892, the son of John and Sophia Danby. The family at the time were living at 89 Wallace Street, New Wortley and Reginald was baptised at the Holbeck Wesleyan Methodist on the 10th May 1892. John and Sophia seem to have had a nomadic lifestyle - their children being born in several places: Archibald (1885) in Sowerby, Florrie (1886) and Sophia (1887) in Chelsea, Sidney Herbert (1889) in Fulham and Reginald (1892) in Wortley, Leeds. John was a bricklayer, so perhaps he was travelling for work. Reginald's mother, Sophia, died in 1894 in Thorpe, Yorkshire. Interestingly, Reginald was not with his parents on the census nights of either 1901 or 1911. In 1901, while his parents were at Potter Newton, Leeds, the eight year old Reginald was staying at 5 Holgate, York with his uncle Edwin Fletcher, a groom, his wife and three sons. In 1911, his widowed father was living in Collingham with some of his children, but Reginald was not with them and we have been unable to find him in the 1911 census. Reginald's service record has survived - but it highlights a further intriguing mystery! Reginald enlisted for military service on the 5th January 1912 and joined the Lancashire Fusiliers in Bury. On enlistment, Reginald gave his name as John Taylor, a 20 year 9 month old, canal boatman on the Leeds and Liverpool canal. He listed his brothers as Archibald Taylor and Sydney (address unknown). His father is listed (although perhaps added later to the form) as John Danby, Limekiln House, East Keswick, Leeds. We do not know why he gave a false name at that time. Reginald was posted to the 2nd Battalion Lancashire Fusiliers on the 24th April 1912. On the 13th January 1913, he was in Dover, where he was passed as fit for service in Indiaand he arrived in India on the 4th March 1913 and was posted to the 1st Battalion Lancashire Fusiliers. On the 13th January 1914, in Hyderabad, Reginald admitted to the Army that he had enlisted under a false name and he showed a birth certificate - his army record was amended at that point to show his true name. I, Reginald Danby, do solemnly and sincerely declare that I was enlisted on the 8th day of January, 1912, under the name of John Taylor, which name I now declare to be incorrect. The name of Reginald Danby contained in the accompanying certificate of birth, I now declare, to be my true name, and I make this solemn declaration conscientiously believing the same to be true, and by virtue of the provisions of an Act made and passed in the sixth year of the reign of King William the Fourth, chap: 62, entitled "The Statutory Declaration Act, 1836". Signed Reginald Danby, Private, 1st Battalion Lancashire Fusiliers. Declared before me at Hyderabad Sind this thirteenth day of January 1914. From the 1st July 1914 to the 17th September 1914, Reginald served in Karachi and then from the 27th September 1914 to the 16th December in Aden. At that time regular British troops were being recalled to the UK for service on the Western Front and elsewhere and Reginald served in the UK from 17th December 1914 to the 15th March 1915 when he went with his Battalion to Gallipoli. The original newspaper article (above) suggested he had been wounded in the elbow. His service record records a gun shot wound to his foot suffered on the 9th May 1915 in Gallipoli. It is likely that Reginald served through the Gallipoli campaign and was evacuated in December with the rest of the British troops. On the 5th January 1916 he was in the UK and served with home forces until the 4th July 1917. This service included a furlough from the 19th February to the 28th February. Also during thsi time, Reginald was transferred to the 3rd Battalion Lancashire Fusiliers (on the 28th February 1916) and again on the 10th March 1916, to the 9th Battalion Machine Gun Corps. Another transfer, this time to the 66th Battalion Machine Gun Corps on the 5th July 1916, was immediately followed by embarkation to sail to serve in Salonika. Reginald served in Salonika from the 14th July 1916 to the 4th August 1918. In Salonika the normal dangers of fighting in a war were supplemented by illness and disease. Many men suffered. Reginald did not escape - in early August 1917 Reginald was taken sick and was diagnosed with malaria. Reginald was posted to 82 Company Machine Gun Corps on the 7th January 1918 and embarked for the UK on the 13th July. His service record shows that he was invalided from Salonika and became a transport driver in 82 Company MGC. However this was not the end of his Army career. On the 3rd October 1918, Reginald was posted to France. His illness still clearly troubled him and he was admitted to hospitals in St. Omer and Dieppe in November 1918. Return from hospital saw a posting to 2nd Battalion Machine Gun Corps on the 5th January 1919. He was then taken off the strength of the British Expeditionary Force on the 20th April 1919 and joined the Rhine Army. He served there until the 3rd May 1919, when he returned to the UK for demobilisation on the 10th May. About one month later, on the 8th June 1919, Reginald was discharged from the Army under King's Regulations paragraph xvi (a) "Surplus to military requirements having suffered impairment since entry into service." 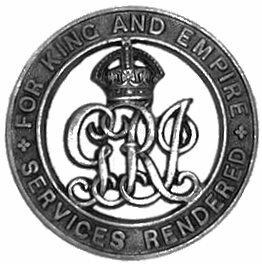 Due to his injuries, as well as the British War Medal and Victory Medal, Reginald was awarded a Silver War Badge. After the war, we believe he return to the UK and settled in Cheshire. He died in Cheshire in 1971.